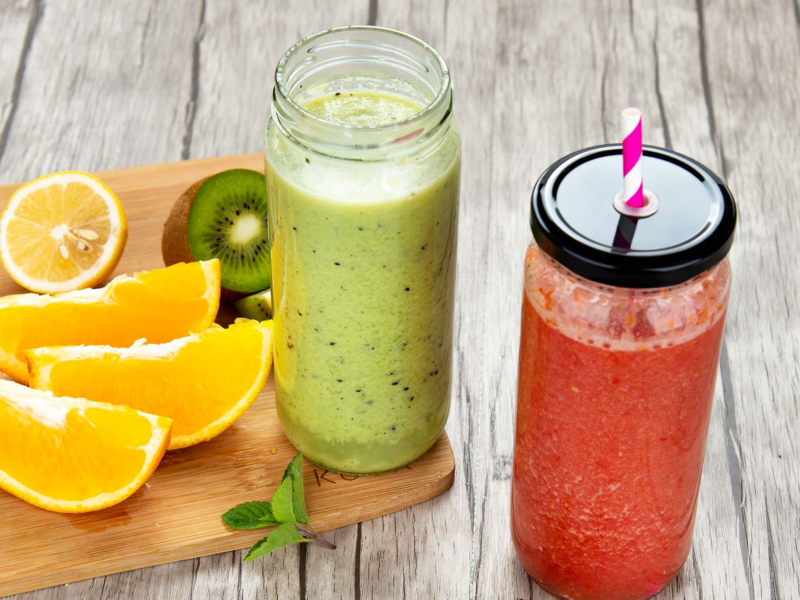 Do you love smoothies and juices? A great smoothie can provide everything you need all in one delicious gulp. However, making a smoothie isn’t always easy when you have a jam-packed schedule. You could forget and miss out on getting this health boost through the day. Luckily, this guide will tell you everything you need to know about how to plan ahead and why this will help you! Smoothie jars that you can drink from or use a non spill straw lid. There are various ways to plan ahead when you are making smoothies and adding them to your diet. The 2 options are to prep ahead bags of ingredients – chopped up fruit/veggies and greens and then pop these bags into the freezer. You then add the frozen pre prepped contents and add your milk of choice. The other option ( Which I prefer) is to use smoothie jars. You make up a couple of batches of your fave smoothies and then put them into a freezer safe jar and freeze them all ready made up. Never fill a jar right up to the top – leave at least 2 inches from the top as the liquid expands when frozen and it will pop the top of the jar or crack the jar. Take out a jar the night before and pop it into the fridge and it is ready to drink the following morning. Or if you want a smoothie for lunch. Take it out of the freezer in the morning and take it with you and it will be ready to drink at lunch time. These jars are safe to use, watertight and have a fantastic wide mouth. The wide mouth means that you can use them to drink straight out of the jar – just like a glass. Some jars do come with straw lids – these are great to use when you get to work so you can sip away during the morning. If you want to add a scoop of protein powder on work out days, you won’t spill any powder when you add a scoop into a jar. As well as this you can use smoothie recipes that fit a 16oz jar beautifully so there is absolutely no waste. At the bottom of this post I have 6 downloadable recipes for a 16oz single serve. The jars can be stored in the fridge and may last up to three months in a freezer. So, you can simply take one out, defrost overnight and use the next day! You can use these jars to to make fruit infused water or cold brewed teas. Cup up desired fruit, herbs or tea bags and top with water and drink throughout the day. You could even pre make these and freeze them as well. ( Again never fill a jar to the top – Always leave a 2 inch gap. What do you currently drink your smoothies out of? Glass has health and environmental benefits or are you looking for a way to take your smoothies (or juices) with you? Cooking Gods have just released their new Smoothie jar range. All done in 2 simple clicks. Limited number of coupons – So don’t miss out! Planning ahead can save you a lot of time on the days where it feels like there aren’t enough hours in the day. Getting in all your meals, including your five a day can be a nightmare, but this doesn’t have to be the case anymore. Everyone loves a refreshing juice or smoothie, but do you know how much sugar is in the store bought ones? Instead of taking this route, you should be making your own at home so that you know every ingredient that has gone in there. The big benefit here is that you can be one hundred percent sure that your juice or smoothie is full of everything that you need to keep yourself feeling fit and healthy. And of course the other HUGE benefit by making your own you will save a lot of money after the initial outlay for a blender, storage jars and the ingredients. By planning ahead and making various juices or smoothies, you are going to ensure that you get all the nutrients that you need. Your body needs certain things to function at maximum capacity so watching carefully what you are putting in your drink is going to be helpful here. For example, if you know that you are lacking on a certain vitamin or mineral, you can find fruit, vegetable or supplement that is high in that specific area and ensure it is in your smoothie for the day. This is going to be especially important if you are looking to lose weight, or are aiming to be all around healthier than you were before. You can also add protein powder to your smoothies on the days that you workout. You can be prepared for every day by some simple planning ahead of time. Now you’ll be able to fit smoothies and juices into even the busiest of schedules. You can even save money by making smoothies in bulk for a good few months! We hope you can plan ahead to enjoy this refreshing treat in the mornings. 6 Smoothie Recipes for the morning and you can make them ahead. What Smoothies are in the Ebook. Or if you would rather just read the recipes – You can click on the names to see the individual recipe post. Your Recipes are on the way to your Inbox!! Click here to go to Amazon to grab a set of Smoothie Jars and get a 15% coupon code on Amazon.